There are some skills that are essential, no matter what you desire to do in life and one of them is self-discipline. The funny thing is that it takes self-discipline to develop self-discipline, but thankfully we all have a measure that we can improve on. Self-discipline is like a muscle that must be exercised to become stronger and more robust. The key is to start small and build progressively. Consistency will yield small, continuous improvements. Self-discipline is a learned behavior that is at the heart of all success, and begins with your habits. SeIf-discipline will allow you to become the master of your thoughts, emotions and behavior instead of a slave to them. True self-discipline is not restrictive, but rather gives you the freedom to use your gifts and talents to the best of your ability. We all have certain goals that we want to achieve, and often while relentlessly pursuing these goals we are faced with various difficulties and obstacles. These obstacles attempt to hold us down and prevent us from doing what we believe we were born to do. Sometimes we cause these obstacles and sometimes we have nothing to do with them. Nevertheless, they are in our way of achieving our goals. No matter how those obstacles got into your life it is your duty to yourself to overcome it and press on. Often times the obstacles that attempt to hinder us, actually cause us to grow and learn new tools that help us live better lives. So my message to you is to press on push forward and don’t give up on the conquest of your goals! A healthy life is a disciplined life. Self-discipline is the ability to control your feelings and overcome your weaknesses; the ability to pursue what you think is right despite temptations to abandon it. 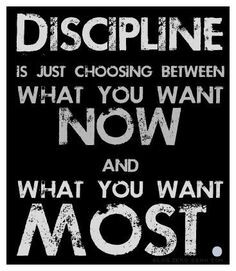 Discipline is important because it brings stability and structure to your life, by forcing you to make certain beneficial decisions. Discipline limits obsessive behaviors and promotes healthy ones. Overcoming a weakness is a very important part of self-discipline, as essentially this is the reason for having discipline. The key to self-discipline is consistency. Consistency is conformity in the application of something. Therefore, if self-discipline is to be maintained you must hold true to your disciplinary goal, without faltering. We’ll use weight control again as an example. If the three days you picked to work out are Monday, Wednesday and Friday, no matter what, you should consistently go to the gym on the days, to the point that it becomes a habit and a natural part of your life routine. So many make the mistake of keeping tempting situations in front of them, whilst trying to develop self-discipline. Unless you have incredibly high self-control, it will be virtually impossible to stay disciplined if tempting factors constantly surrounds you. Once again we’ll use the weight control as example. So, you already committed to going the gym three times a week, no matter what; however, one day on the way to the gym, you hear that Krispy Kreme is offering free donuts today. The route you regularly take to the gym will take you right past Krispy Kreme, but to avoid a tempting situation, you decide to take a different route, and so preserving your dietary program. Decisions like this will make maintaining self-discipline successful. The last key to maintaining self-discipline is to be able to forgive yourself and move forward when a mistake is made. No one is perfect and we’ll all make mistakes sometimes. So don’t let your mistakes weigh you down, brush yourself off and pick up where you started, don’t allow yourself to wallow in self-pity. So many times people that are trying to maintain self-discipline mess up then go into a downward cycle, and in the case of weight control, they gain back or lose all the weight they worked so hard to lose or gain. Don’t let that be you. The next time you fall, be prepared to get straight back up. Procrastination is the thief of time. It will creep in and cause you to squander the time that you could have used to achieve more effectively. It will fool you into believing that you have enough time to complete the task at the last minute. Procrastination will make you lie to yourself, and distorts your rational decision making ability. There is more to avoiding procrastination than just being more organized. If you do not have will-power, all your organization efforts will go down the drain. Planning to do something is not the same as actually doing something. Procrastinators are usually great visionaries, and great planners, but are poor implementers. The hardest thing for a procrastinator to do is either to start, or to bring something to a complete end. To beat procrastination, you have to first admit that it is something that you do, and recognize the harm it causes in your life. Some of the results of procrastination are: you are constantly stressed or in a state of panic because there is a looming deadline that will be near impossible to meet; you don’t reach your full potential or produce your best work; always criticizing yourself for repeatedly ending up in this situation. You must make a choice to do things a different way. Create methods that will force you to be accountable, such as: getting family or friends to hold you to the goal you have set; schedule and make public a deadline that cannot be avoided; establish small rewards for yourself that can only be enjoyed after you reach a set level of achievement; break big goals or projects into a series of small, manageable tasks. Aim for slow progress over an acceptable space of time, rather than a panicked explosion of work at the last minute. There is more to beating procrastination than being more efficient at work, it is about gaining control of your life and your happiness, which leads to greater relationships, greater feelings of fulfillment and greater productivity. Feel free to leave your questions or comments. Many people have dreams, but do not work towards them because of the time and effort they know it requires. They may say things like, “I don’t have enough money,” “I don’t have the knowledge and experience,” “I’ve failed before”. The reality is, we all have the potential to fulfill our dreams. Our purpose does not change but it takes an intentional effort by us to make it happen. Your dream or your purpose should be what shapes your life and dictates the choices you make throughout your life. Once you understand the dream and the reason for it you should be motivated to move in that direction. Many people live aimless lives because they are not pursuing their purpose. Don’t get discouraged on the journey. It will not happen overnight. 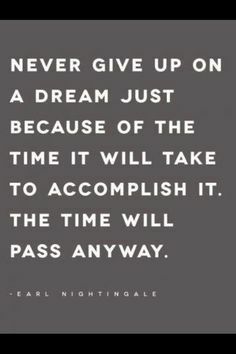 Your dreams deserve the time and effort it takes to achieve. There are people who need you to come through on your dream so that their lives can be changed. The bigger your dream, the more time and effort it will take to achieve. Take time to develop the courage and determination it will take to succeed. You can grow beyond your limitations and accomplish your goals. You owe it to yourself and to the world, and you are well able to do it. It’s Wednesday! We’ve made it half way through the working week! Make sure you celebrate every achievement and don’t dwell too long on any mistakes you’ve made this week. 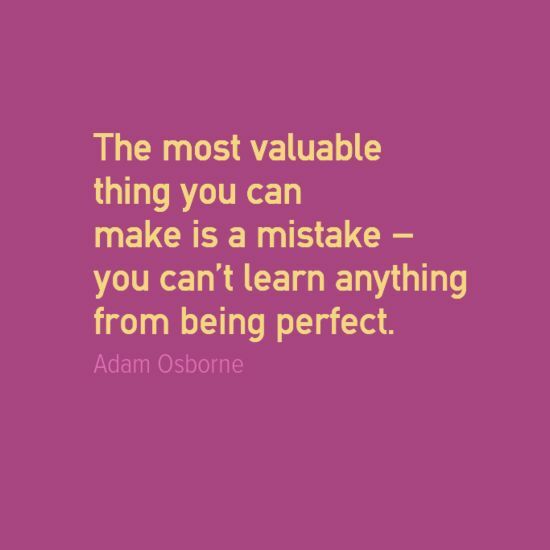 Put a positive spin on any mistakes by learning from them. Mistakes show productivity. Firstly, if you were not doing anything, you wouldn’t have made a mistake, so right off the bat a mistake shows that you were working on or towards something. It doesn’t feel good because it exposes an area where we need to improve, or where we thought we were capable when we really aren’t. But that’s OK. Mistakes are inevitable when you are advancing. Mistakes cause growth. A mistake, however big or small, should force you to face a reality about yourself. It could be as simple as realizing that you need to stop rushing and take your time, of as huge as needing to take classes to update or learn a new skill. Allow your mistakes to grow you emotionally – by developing your patience, developing your ability to let things go and developing your ability to positively introspect. Allow your mistakes to grow your skill set – by revising your approach, identifying problem areas and adding to or updating your skills. Redefine the way you think about mistakes. Understand that mistakes are part of the trial and error process that we all go through in life. In fact the struggle we go through when challenged with correcting or changing because of a mistake causes neurological advancement within our brains. The key to handling mistakes is to take responsibility, value the mistake and explore how to prevent it from reoccurring.